Down East Looks. Twin Outboard Power. 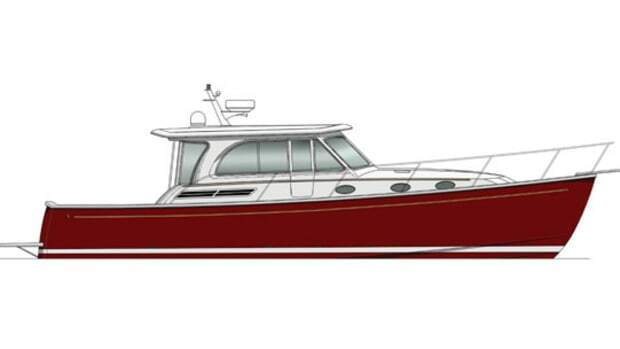 For the traditional Maine builder, their first outboard-powered vessel has changed the game. Consider the Back Cove 34O. 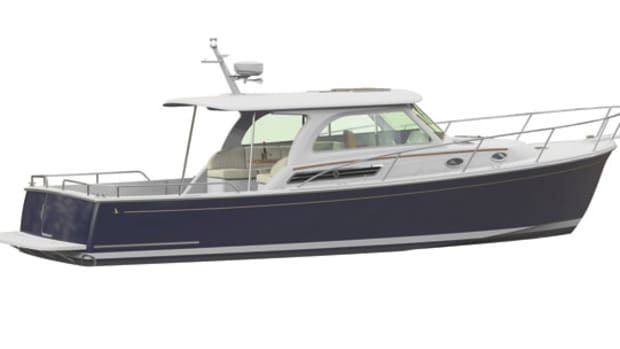 To call the new, outboard-powered vessel from the traditional Down East builder a design departure would be short shrift. 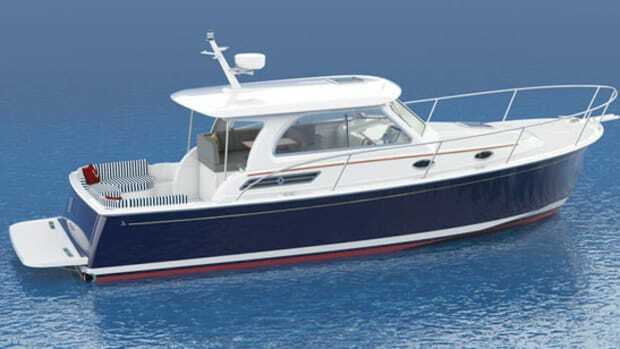 This is a new model, after all, from Sabre’s not-so-little sister company that has made their bread and butter building dependable, efficient boats in the Maine lobster-boat style—each powered by a straight-shaft, single diesel. This is a monumental change of pace, like swapping the blue heron on the builder’s logo for a flamingo. The blue heron remains, just look for it to be moving a little faster aboard the 34O. 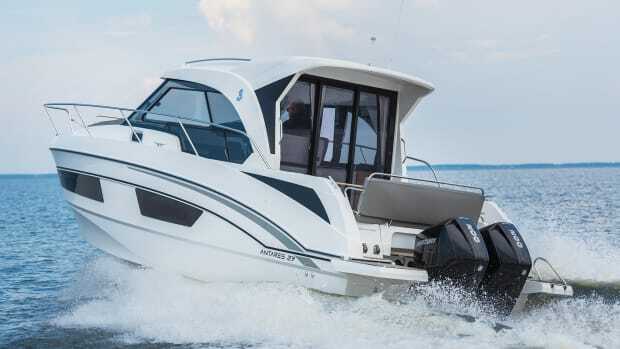 ‘O,’ of course, refers to the power—a pair of standard Yamaha 300s—or the dumb-founded noise one makes after seeing them affixed to the transom for the first time. I made a similar expression when I first locked eyes on Hull No. 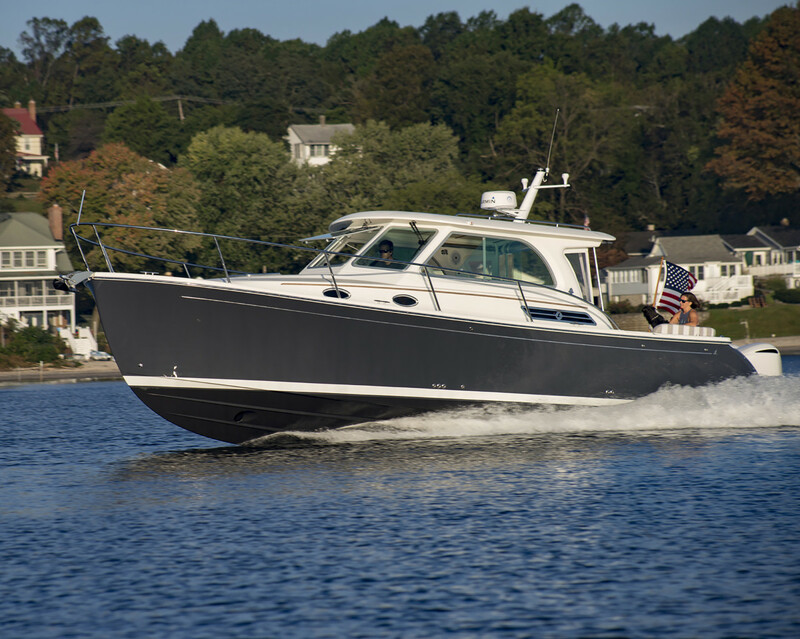 1 at last year’s Newport boat show, where it made its debut, before taking it on an extended cruise with Kevin Burns, Back Cove’s vice president of design and product development. The 34O was the first outboard-powered boat Burns had ever built, and he was enjoying the mostly positive feedback it was receiving. Typically, when sea trialing a boat for the day, you get calm waters. Don’t ask me why. Maybe the sea gods have a soft spot for marine journalists. Whatever the case, it’s nice for keeping your brainstem intact, but not so great for achieving verisimilitude and realistic performance. 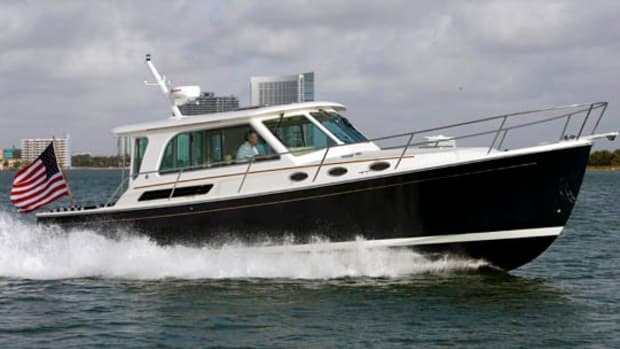 An extended cruise afforded Burns and I the ability to see how the 34O handled a multitude of snotty conditions, from 6- to 8-foot swells in the Atlantic to choppy seas in the Chesapeake. I was impressed with how the 34O handled the Atlantic’s larger head seas. This is an entirely new hull, designed specifically to optimize outboard propulsion—but with added speed came a tradeoff in weight reduction. 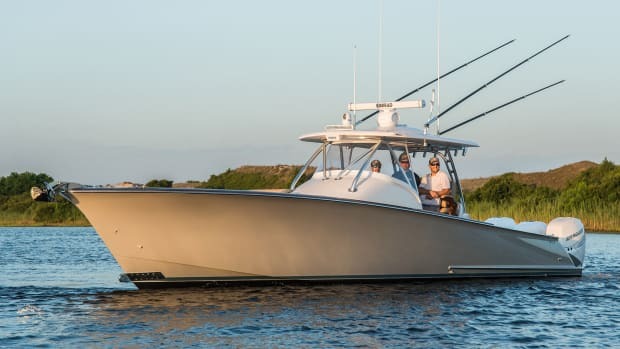 To get a displacement of 17,000 pounds, or about 10 percent less than the builder’s popular single-diesel 32-footer, the builder swapped solid fiberglass topsides for cored versions. But Back Cove didn’t skimp on joinery or seaworthiness. 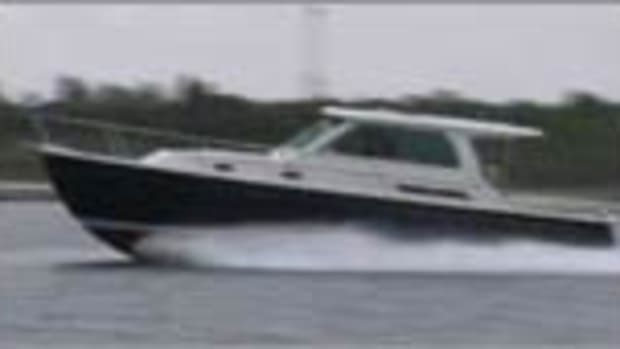 Cruising around 24 knots in those conditions, I never once felt like we were taking a step outside the hull’s comfort zone, and the relative silence on board while we were blasting through the spin cycle was revealing: this is a solidly built vessel. Entering the Chesapeake allowed the boat to really shine. 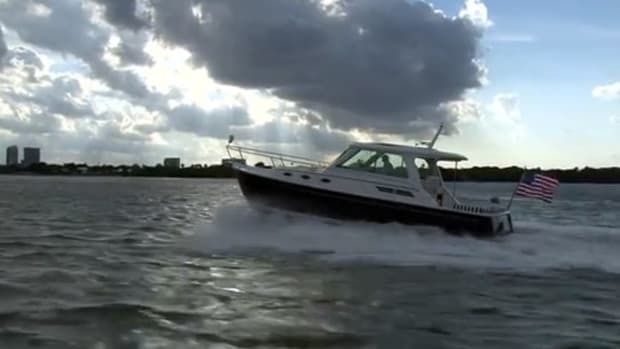 The company’s literature proposed the 34O could blow the 32 out of the water, with a top speed approximately 10 knots faster than its diesel-burning cousin. 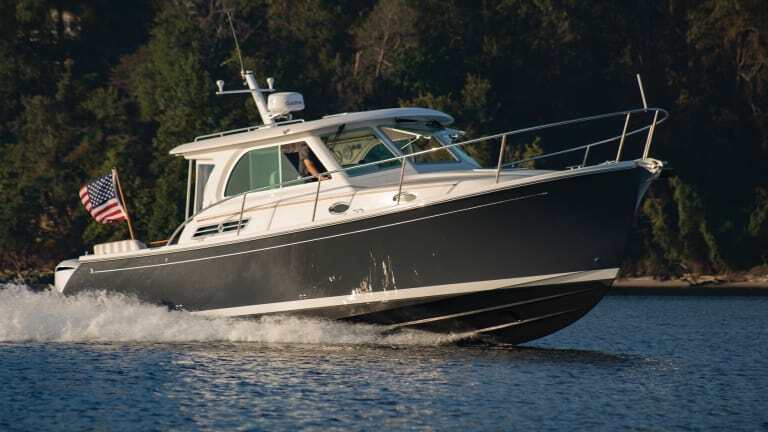 A redesigned hull, combined with the boat’s standard power (Yamaha and Suzuki 350s are optional) put us at 37 knots with the throttles down, right on the builder’s target brief. Before long we were cruising comfortably at 30 knots. “This is what the boat was made to do,” intimated Burns. Classic Down East lines and a graceful sheerline hitting those numbers? It was nothing less than exhilarating. 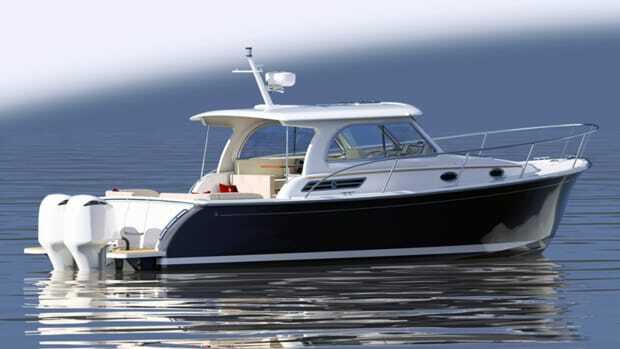 Aside from a faster top hop, the biggest beneficiary from the changeover to outboards is stowage. Below the salon, underneath the one-level deck is now an enormous compartment—bye bye diesel engine—for bikes, stand-up paddle boards or miscellaneous gear, all easily accessed by an electrically controlled hinge. 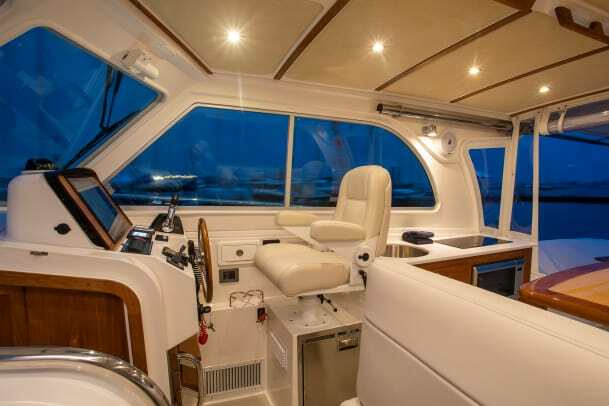 Belowdecks, a king-sized berth is forward, while the cockpit is meant for entertaining with an aft-facing seat that converts into a U-shaped dinette or second berth in a pinch.